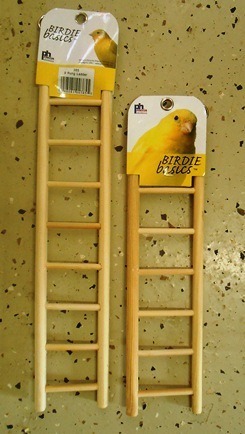 3, 5, 7, 9 and 11 rung Wooden Bird Ladders! All cage birds need a ladder from time to time. They are fun to run up and down, or to reach a perch or feeder. They are made from soft pine and smooth for your birds safety. Just lean against cage wall, it easily attaches with 2 metal cup hooks at the top. Can also be hung from the roof for environment psychological enrichment. Enhances almost any cage birds environment. Help handicap of elderly birds reach the perches and food with less effort.